Continuation of Dong Da rally. Entertainment includes military band. 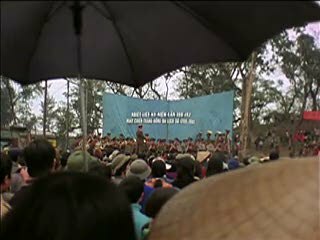 Chicago: “Vietnam: A Television History; Dong Da Rally,” 02/09/1981, WGBH Media Library & Archives, accessed April 19, 2019, http://openvault.wgbh.org/catalog/V_7C36DB1563064C9E8A62187B170C8B1B. MLA: “Vietnam: A Television History; Dong Da Rally.” 02/09/1981. WGBH Media Library & Archives. Web. April 19, 2019. <http://openvault.wgbh.org/catalog/V_7C36DB1563064C9E8A62187B170C8B1B>.